The only slightly worrying thing about all the belated acceptance that the Baltics are going to have one of the hardest landings in the global economy this time round is the apparent collective failure to do the ritual “soul searching”, and address the tricky issue of just what it was in the original analyses which lead so many to place such trust in the good intentions of the Nordic Banks and in the consequent probability of a soft landing, since the danger is now that we simply get misplaced policy piled upon well-meaning but misplaced policy in an attempt to address problems whose roots (which I am convinced are located to some extent at least in the regions rather peculiar demography) are quite simply left untackled. That is, we remain stuck on the currency pegs, we continue to count on the goodwill of the Nordic Banks, we expect wages and prices to exhibit a downward flexibility not seen, for example, in a comparable country like Portugal, whilst over at Eesti Pank (the Estonian National Bank) they still expect the recovery to begin in 2010 (in rather stark contrast to the much more realistic assessment for the US economy from the Congressional Budget Office – who don’t expect the US recovery to really get underway till 2012, and don’t see trend growth being reached till 2015). If they were serious about seeing through the correction in terms of allowing a long and painful downward adjustment in living standards to take place as the favoured alternative to devaluation, then they would realise that this process would really only be getting itself going in 2010, let alone be over – so why, oh why, I ask myself, do people in the Baltics insist on trying to view things through such rosy tinted spectacles? The main ones hurt by all this at the end of the day are those very people we are all, I am sure, trying so hard to help. 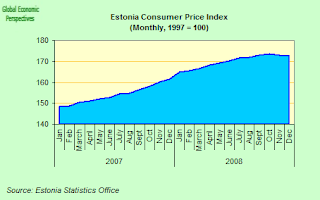 The Estonian economy should start to recover by 2010, according to the nation’s central bank.Although Eesti Pank expects the country’s gross domestic product to fall by 4.48 per cent in 2009, growth could be experienced in as little as 12 months, reports Baltic Business News. 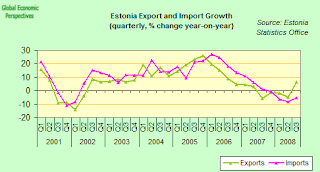 Basically the future outlook for the Estonian economy lies in exports. 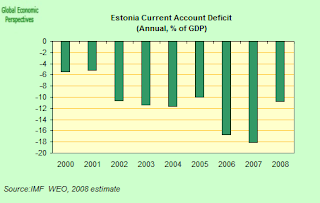 This simple point should not be so hard to grasp, since it can be easily deduced from one fundamental structural aspect of the Estonian economy: the presence of a fairly large current account deficit (which admittedly is not as large as the Latvian one, but the fact that others are even worse off is somehow cold comfort here) which now needs correcting. In fact, as we can see in the chart below, the correction has already started. A new upward cycle highly depends on the reallocation of labour to sectors with stronger productivity growth………..Possibly, the new cycle will require part of the workforce currently serving domestic demand to be reallocated to export oriented sectors. 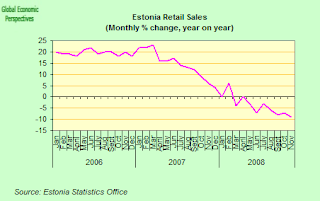 Otherwise Estoniaâ€™s economy might be facing a long period of slow growth. It should also be said that in some cases a new job may entail smaller wages, although households are not really prepared for that. I think it is possible to be a bit more specific and explicit than Eesti Pank on all of this: the new cycle will (certainly, definitely) require part of the workforce currently serving domestic demand to be reallocated to export oriented sectors, and in almost all cases a new job will entail smaller wages (and indeed existing jobs will have to accept wage reductions), since this is quite simply what maintaining the krona-euro peg entails – if you don’t devalue, then you need to reduce wages and prices to achieve the same result. Of course, as the bank notes, “households are not really prepared for that”. Basically Estonia (and most other CEE economies) have been running large CA deficits due to the insufficiency of domestic savings to meet the principal lending and borrowing needs, so the first thing Estonians are going to need to do (and not for one year, or two years, for several years, I hardly see the structural position of the Estonian economy being better than the US one at this point, so we are talking about a correction which can run all the way through to 2015, and while we may have some sort of idea what US trend growth may be in 2015 – the famous 2% – we have no idea at all what trend growth could be in Estonia at that point, but certainly a lower than many imagine). 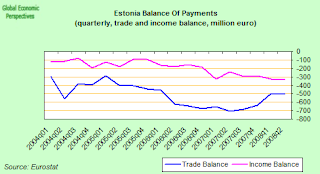 Another reason Estonians need to save can be seen in the chart blow, and that is the divergence between the evolution of the trade balance (which is improving) and the income balance, which continues to deteriorate. Basically the income balance reflects the difference in interest paid on loans (and dividends paid on equities) between outsiders investing in Estonia, and Estonians investing externally. This balance is deteriorating, and this steady deterioration needs to be arrested, since otherwise the achievement of a simple goods and services trade surplus will be of no avail, if all the proceeds are simply sucked out in a negative income stream. 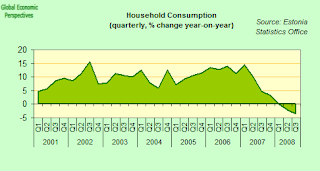 This ongoing correction in the CA deficit is, of course, easily visible in household consumption, which is now year on year negative (see chart), where it will remain as far ahead as the eye can see (this is a simple deduction which comes from the need to save). At the same time the trade balance is going to have to be turned round, and exports begin to take a leading role, something that they were conspicuously unable to do for many, many quarters, although there is a little evidence from Q3 2008 that the position may have begun to improve. However, as Eesti Panki themselves note, with the worsening external environment this improvement is going to be hard to maintain in the short term. But I really do think it is important not to fall into fatalism on the export question at this point. Simply because doing anything is hard is not a good reason for sitting there with folded arms and doing nothing. The first step towards recovery will come not from the exports themselves, but from the fixed capital investment (machinery, plant and equipment) which will be undertaken in order to make exports subsequently possible. But to attract the FDI you need to get relative wages and prices competitive, you need to convince would be investors that you are a better destination than your rivals. Sorry, but capitalism is just like that, this is how it runs, and you can’t take one part (the bit you like), and ignore the other (the bit you definitely don’t like). There is, for better or for worse, a competitive process at the heart of all our economies, and not every situation can be straightforwardly win-win (would that!). So basically, if there do have to be winners and losers here, are you happy for your country and your economy to stay in the second group, and wait and see if eventually a rising tide can lift all boats. 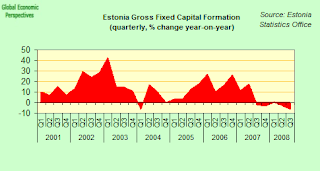 At the present time, as we can see in the chart below, Estonian fixed capital formation is also running at a pretty constant year on year negative, and this is the part Estonia needs to turn round, since without this turnaround the economy will simply not get that productivity boost which again almost everyone agrees forms part of the solution recipe. 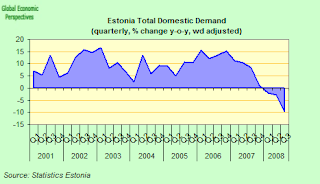 So with private consumption falling and investment falling, it isn’t hard to understand that even the small increase in govenment spending that Estonia can permit itself is insufficient to stop total domestic demand from falling. All of this “macro” level data is of course also reflected in the day-to-day data releases we are seeing, and as might only be expected Estoniaâ€™s industrial production fell the most in at least 14 years in November. 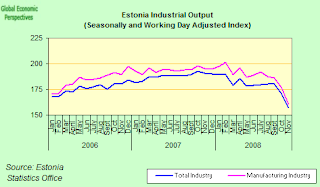 Output fell 21.7 percent, the most since at least 1995 when the Tallinn-based statistics office started compiling data in this series. This compared with a revised 11.7 percent drop in October. than the 3.5 percent fall in the third quarter. Output adjusted for working days was down by an annual 17.7 percent, while manufacturing industry, which is the second-biggest contributor to GDP (second only to the property sector and construction industry) fell a working-day adjusted 25.5 percent, led by a 40 percent fall in the output of building materials and a 30 percent decline in textilesâ€™ production. Forty-nine percent of Estonias industrial companies said they are planning job cuts in the next three months, according to a recent survey by the Eesti Konjunktuuriinstituut research institute. Company order books were down to 3.4 months of future output in December compared with historic average of 5 months. Capacity usage was down to 67 percent, compared with an 81 percent-average for the European Union as a whole. As we can see in the chart below, it isn’t only the year on year readings in recent months which indicate deterioration, the output index peaked around the start of 2008, and is now heading sharply down even below the levels of early 2006. Companies like seatbelt manufacturer the Swedish subsidiary AS Norma (who have announced plans to cut 52 jobs, or about 6 percent of the workforce) or Dutch office equipment manufacturer Atlanta Office Products BV, a Dutch office supplies maker (who planto close their factory in Kohila, northern Estonia, with the loss of more than 200 jobs) are steadily reducing jobs, possibly the numbers seem small, but do remember Estonia really is a small open economy. As a result Estoniaâ€™s seasonally adjusted unemployment rate rose to 8.3 percent in November from 4.1 percent a year ago, the second- biggest jump in the EU following Spain, according to the latest data release from the EU statistics office, Eurostat. The unemployment rate may rise to 10 percent by next year, according to a worst-case scenario proposed by The Estonian Finance Ministry in November, but it now seem that even that level may now be a significant underestimate, although it really does depend on whether we are referring to the unemployment rate as measured by the Estonia Labour Board methodology or the one the Estonian statistics office supply to Eurostat using the EU harmonised methodology (the Estonian Labour Board number is significantly lower). 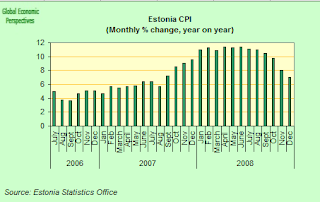 At the same time Estoniaâ€™s inflation rate is falling (if still far to slowly) and hit its lowest level in 16 months in December – 7 percent, the lowest since August 2007 down from 8 percent in November. So inflation is falling quite fast and is likely to significantly undershoot the central bank forecast of 3.7 percent in 2009. In fact prices fell on the month by 0.2 percent from November. This was largely the result of a sharp fall in fuel prices – down 8.1 percent from the previous month – but food (up 0.5 percent) and administered prices still continue to rise. However, as we can see in the chart below, the general index has now been more or less stable since the summer. 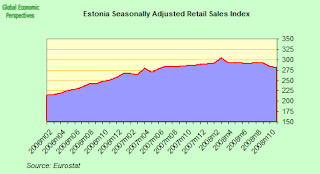 Estonian retail sales also posted a record decline in November – dropping by an annual 9 percent (the most since the start of the present time series in 1994, following a revised 7 percent drop in October. This drop includes an annual fall in car sales of nearly 50%, while the value of food sales is already falling in prices not adjusted for inflation. The constant price sales index also peaked at the start of 2008, and it will be a very very long time before we see domestic retail sales hitting this sort of level again, which is another good reason why employment needs to be steadily displaced out of the domestic sector and into the export one. According to the latest data we have from Statistics Estonia, October goods exports were up by 13% year on year while imports declined by 3%. Goods to the value of 13.2 billion kroons were exported, 1.5 billion kroons more than in October 2007 – however the growth in exports was largely caused by the increase in the re-exports of fuels – up by nearly one billion kroons. Imported were down to 15.7 billion kroons – 0.4 billion kroons less than in October 2007. The decline was the result of a decrease in domestic demand with the biggest falls being in the transport equipment and in machinery and equipment sections. 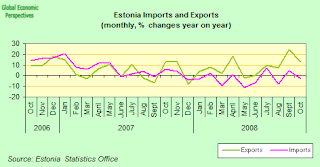 As a result of the increase in exports and the decrease in imports the Estonian foreign trade deficit fell to 2.5 billion kroons – 1.9 billion kroons less than in October 2007. If we take account of the increase in re-exports it is evident that the reduction in imports for the domestic market was much sharper than the aggregate 3%. 63% of October exports went to the EU and 17% to CIS countries accounted for 17% of the total exports. The main destination countries were Finland, Russia and Sweden. “The major policy challenge is the budget. The 2009 budget incorporates a welcome adjustment that required difficult decisions. However, given the deteriorating global outlook, our assessment is that the deficit will likely exceed 3 percent of GDP in 2009 and beyond. This does not present a near-term financing risk given the prudent accumulation of fiscal reserves via surpluses in recent years. But the current fiscal posture is not sustainable going forward. Moreover, it risks breaching the Maastricht fiscal threshold just when inflation is receding. This could delay euro entry, which the authorities rightly consider to be their highest priority. What is needed now is early action to achieve fiscal consolidation. 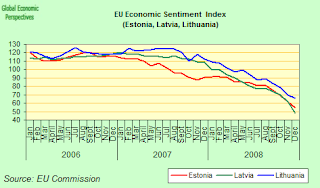 This view is not entirely confirmed by the latest EU economic sentiment index reading (see chart above) which shows Lithuania still in an apparently better position than Latvia or Estonia, but Christoph’s reasoning here is based on his assessment that Lithuaniaâ€™s economy is about to â€œdecline sharplyâ€ and I am hardly in any position to dispute his view here (nor would I wish to, I simply have not been following Lithuania closely enough). In fact the IMF forecasts that Lithuania’s economy may well contract by â€œat leastâ€ 2 percent in 2009, even though Lithuania’s central bankâ€™s suggested an expansion of 1.2 percent in their October outlook. But on the one had we all know that the economic outlook in the CEE economies has deteriorated significantly since October – as domestic demand has waned and banks have tightened lending – while “at least” means simply that, the number could well be a lot worse. interview conducted on Tuesday in Warsaw. What the IMF is referring to basically is the fiscal reserve which Estonia has, there is no accumumulated national debt, and indeed the government as net assets to the tune of something like 5% of GDP, so there is a certain leeway to use this money to soften the impact of the correction, although it is important that the country’s savings are spent on facilitating the necessary correction and not on postponing it. As Christoph Rosenberg points out the Baltic problems were created by a soaring wages and a credit boom which saw funds channeled into non-tradable sectors like real estate, retail and banking. As a result these economies became structurally distorted and they didn’t diversify enough since insufficient was done to curtail rapid credit growth and to use counter-cyclical fiscal policies to cool the economy off before it was much too late. The danger is that if in the downturn we get the same inability to translate sound economic sense into practical economic policy that we saw during the upcycle, then problems can become worse, a lot worse, without getting any better. That is Estonia’s challenge, and if it isn’t grasped fully and with both hands then it can just as easily turn into Estonia’s tragedy. 12 years from now (ie come 2020) Estonia’s population will be much older, and the elderly dependency ratio will be much higher, than it is now. It is also to be imagined that the potential annual GDP growth rate will be comparatively lower, even as the needs for social spending rise and rise. 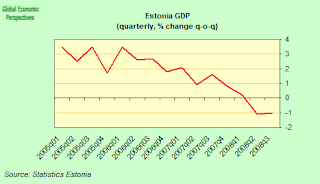 So while Estonia still has a window of opportunity, it is not an indefinite one, and once it closes it won’t come back. I think Estonia’s citizens would do well to dwell on this point.